There is an untapped power within all of us. Motivational speaker and performing strongman. Will help you understand that there are untapped resources within each of us that can be used to accomplish amazing things. Mark Burnett is a nationally recognized strongman and motivational speaker, performing extensively here in northeast Ohio, as well as taking his show on the road, from Alaska to Florida. His feats of strength have been featured on the morning TV shows of Cleveland's channel 8 and Youngstown's channel 21. 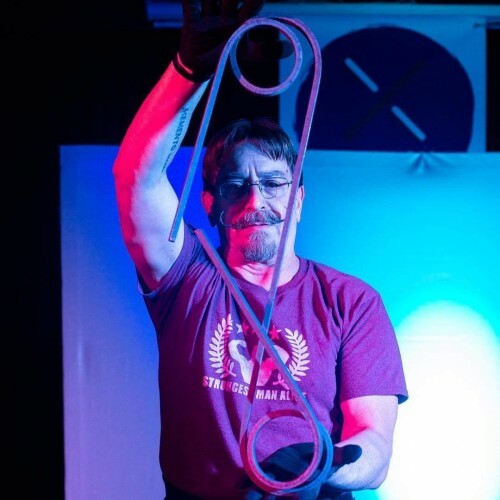 Like many other strongmen…..and a growing field of “Strongwomen,” Mark believes there is untapped potential in all of us, both physical and mental, and he uses feats of strength as an introduction to show what’s possible in all of us. Mark is not a career strongman. In fact, he’s lived most of his life in a “Clark Kent” manner, raising a family and working a regular guy career before getting into the strongman culture just 6 years ago. Now, he entertains you with his feats of surprising physical strength while sharing his common sense tips for bettering yourself physically and mentally. Find out more about Mark Burnett - Strongman at http://www.apowerwithin.us.